This is one of my brother Luke’s trademark recipes. When Luke and mum first told me about it when I moved back in with them recently I screwed my nose up at the thought of such a loathsome vegetable being the star attraction in a pasta dish (Yes, even I – the ex vegetarian – had my doubts! ), but I reluctantly agreed to try it and it truly is one of the most flavoursome (and of course healthy) pasta dishes I have come across in a long, long time. I am betting that it could even get children to eat this often hated vegetable! So give it a go, even if you don’t think it sounds all that appetising. 1. Steam broccoli florets for 5-10 minutes until tender. 2. Cook pasta according to packet directions, drain and set aside. 3. Toast pine nuts in a dry pan on medium-high heat for 2-3 minutes or until browned and oils are released. Remove from pan and set aside. 4. Lower heat to medium and add 2Tbsp of olive oil, add garlic and soften for a couple of minutes before adding pesto, mustard, pine nuts and broccoli. Using a wooden spoon, break up broccoli, leaving stalk pieces a little chunky, but the rest mushy. 5. Add cooked pasta and parmesan cheese, along with remaining olive oil and stir to combine. Cook for approximately 5 minutes, or until cheese is melted and all flavours are mixed through. Serve immediately. Source: Luke Marsden (a recipe he picked up from his ex-girlfriend’s father). – It is important to use fresh broccoli for this recipe as soft, limp broccoli that has been sitting in the fridge for a week will not have the same wonderful taste, and will also not be as nutritious. – Luke didn’t like me writing down quanitities for the ingredients as he doesn’t like to follow recipes, he says that he just puts everything in ‘to taste’, so feel free to put in more pesto if you are a basil fan, or more garlic if you (and your partner) love garlic. When my aunty came over for our Easter BBQ on Sunday she bought with her a huge tray of mangoes. 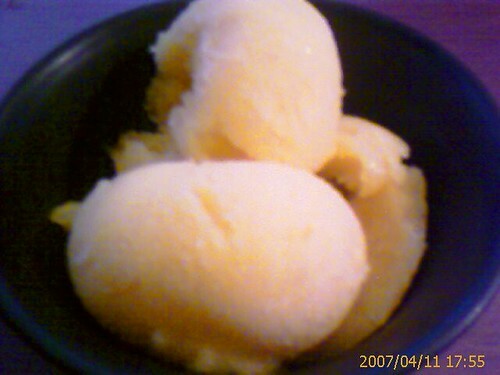 I love mangoes, but these were a little past the ‘eat as they are’ stage, they were quite bruised, so I decided to pick out the good parts and make sorbet out of it. I’ve always thought it would be really hard, but apart from the repetitiveness of getting it out of the freezer and churning it every 90 minutes, it was actually quite easy and the result was really good. I’m going to make strawberry sorbet next time! 1. Place sugar and water in a saucepan over low heat and stir until sugar has dissolved. Increase the heat and bring to the boil for one minute, then set aside to cool. 2. Puree mango flesh in food processor until smooth, combine 2 1/2C of puree with lime juice. 3. Add this to sugar syrup and process to combine. 4. Pour mixture into a cake tin or baking tray, cover with foil and place in the freezer. 5. Remove from freezer when the mixture is beginning to freeze at the edges (60-90 minutes) and whisk or beat with an electric hand mixer, return to the freezer. 6. Repeat step 5 three to five times until the sorbet is thick and smooth. Transfer mixture to an airtight container and keep frozen. Adapted from: Donna Hay Modern Classics Book 2 2003, Harper Collins, NSW, Australia. – You can also use 950g frozen mango flesh to make the puree. – If you own an ice cream maker you can use this to cut down on the freezing time. Just follow the manufacturers instructions. – You can make raspberry sorbet with 1 3/4C strained raspberry puree and 1/4C lime juice, peach sorbet with 2 1/2C strained peach puree and 1/3C lemon juice, or strawberry sorbet with 2 1/2C strained strawberry puree and 1/2C lime juice, or try your own combinations! 1. Mix hoisin sauce, oyster sauce, rice wine, soy sauce, garlic and ginger in a large, non metallic bowl, add the rashers and turn them so they are covered with the marinade. Cover and refrigerate overnight (or at least 4 hours). 2. Remove the rashers for the marinade and tip the marinade into a small saucepan with the honey. Simmer over low heat for 5 minutes or until slightly syrupy. 3. Cook pork rashers on BBQ, turning and basting with marinade frequently until cooked and caramelised, approximately 20-30 minutes. Eat with fingers! Adapted from: BBQ food 2004, Murdoch Books, NSW, Australia. – You can use american style pork ribs in place of the pork rashers, use 2kg and cut into individual ribs before serving. I made this a few years ago at Christmas time and remember it being very tasty. So when mum showed me the recipes she had picked to make for our Easter BBQ I was happy to see she had chosen this one. Again, it was a big hit and a great way to get everyone to eat their vegies. 1. Trim the top of the garlic bulb so the cloves are slightly exposed, drizzle with olive oil and wrap in foil. Put in the BBQ for 15 minutes before the vegetables are put in. 2. Lightly brush the vegetables with olive oil and add to the BBQ, cook for 15-20 minutes until cooked through and marked. 3. Remove vegetables to a large bowl and squeeze garlic cloves out of their skins over them. Mix together balsamic vinegar and left over olive oil and pour over vegetables, tossing lightly to coat. Season with salt and pepper and serve. I made this for our Easter BBQ yesterday. I somehow managed to forget to put the herbs in with all the rush of Easter morning preparation, but it all still disappeared! It would have been much tastier with the herbs though… so try not to forget them like I did. 1. Preheat oven to 180 degrees celsius and lightly grease a 20x30cm baking dish. 2. Microwave spinach and water in a large bowl for 3-4 minutes or until completely defrosted. Place spinach in colander and drain thoroughly. 3. Heat oil in a large frying pan over medium heat and cook onions for 2 minutes or until soft. Add spinach and stir to combine. Cool slightly before stirring through cheeses, eggs, herbs and nuts. 4. Place one sheet of filo pastry in base of baking dish, allowing edges to overhang sides. Spray with olive oil spray and cover with another sheet of filo pastry. Repeat until there are 5 sheets in the base of the baking dish. Spoon in spinach filling and sprinkle with black pepper. 5. Tear remaining filo pastry sheets into 5cm wide strips. Scrunch each strip into a loose ball and arrange over filling to cover. 6. Lightly spray with oil and bake for 35-40 minutes until filling is cooked and pastry is golden on top. Cool for 10 minutes before cutting. Adapted from: recipes+ Jan/Feb 2007, Knockout Media, Surrey Hills, NSW, Australia. – Use 2 bunches of English Spinach, trimmed and chopped into large pieces, in place of the frozen spinach, if your budget allows (or in season), if using fresh spinach cook for a little longer when you add it to the onions so that it wilts and softens. – This pie can be eaten warm or cold. – You can prepare this pie up to 2 days ahead, keep covered in the refrigerator until needed. – Cut the pie into large rectangles for a main meal with vegetables or into small triangles for finger food at parties or picnics. I made this for dinner the other night. I used half veal and half spinach and cheese tortellini, It was scrumptous! 1. Preheat oven to 220 degrees Celsius and lightly grease a 5cm deep, 22 x 30cm baking dish. 2. Roughly chop 3/4 of the basil and combine with tomatoes, garlic and sugar in a saucepan over medium-high heat. Cook, breaking up tomatoes, for 5 minutes or until sauce comes to the boil. Cook, stirring occasionally, for a further 10 minutes or until sauce thickens slightly. Season with salt and pepper. 3. Meanwhile, cook pasta in a large saucepan of boiling salted water for 3 minutes or until partially cooked. 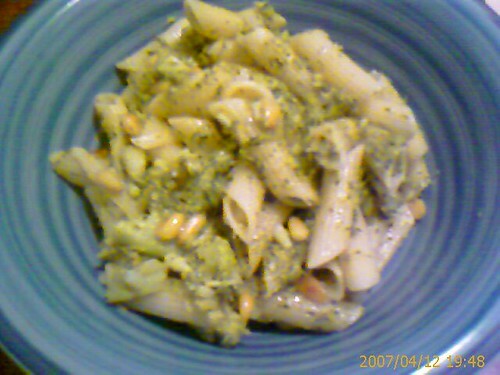 Drain pasta and pour into prepared baking dish. Add tomato sauce and stir to coat. 4. Beat ricotta with a wooden spoon until almost smooth. Dollop over pasta and top with mozzarella. Bake, uncovered, for 15-20 minutes or until bubbling around the edges. Top with remaining basil. Serve. This is one of the best Easter ideas I have ever seen. I work in a bakery and since we ‘bake everything fresh daily’ (& hence have to throw out quite a bit of bread) I end up with a freezer full of hot cross buns as I can’t bear to throw out perfectly good food. This is a great way for me to use them up, but it is also a good Easter treat for dessert. I thought now was a good time to post it so you can try it over the upcoming Easter period. Enjoy, and let me know how it went! 1. Preheat oven to 170 degrees Celsius and grease a 2 litre (8C) capacity baking dish. 2. Split the hot cross buns in half and butter. Lay bases in the baking dish, sprinkle with chopped chocolate and replace tops. 3. Place vanilla pod and seeds in a saucepan with the creams and zest and bring to a gentle simmer over low heat. Remove from heat. 4. Beat eggs, sugar and brandy until just combined and pour into warm cream mixture, stirring continuously. Strain the custard evenly over the buns and set aside for 30 minutes to soak. 5. Place pudding dish in a large roasting pan and pour enough boiling water into the roasting pan to come halfway up the sides of the pudding dish. Bake for 45 minutes or until custard is set. 6. Dust with icing sugar and serve with extra cream. – You can make the pudding up to the end of step 4 and refrigerate until needed, just bring it back to room temperature before putting it in the oven. – Something that I want to try is doing this with fruit hot cross buns and white chocolate, just for a bit of a twist! – If you want to cut down on the effort factor a little (or just make it quicker) you could use bought custard, but homemade always tastes better. This was really, really yummy. The sweet mango went beautifully with the spice of the kebabs. The multigrain breadcrumbs give the kebabs a lovely nutty flavour and help to lower the GI of the meal. 1. Combine mince, onion, egg, chutney, parsley, breadcrumbs and cajun seasoning in a bowl and mix until well combined. Shape into twelve 8cm long sausage shapes, using 1/4C of mixture for each. Flatten slightly and thread onto presoaked skewers. Cover and refrigerate for 1 hour for flavours to develop and for kebabs to hold their shape. 2. To make mango salsa: Remove cheeks from mangoes and cut flesh into 1cm cubes. Combine in a bowl with cucumber, red onion and chilli, toss gently to combine. 3. Preheat barbecue grill or large heavy based saucepan and cook kebabs (sprayed lightly in oil) over medium heat for 20 minutes or until cooked through. Serve with Mango salsa and leftover mango chutney. – You could freeze the kebabs after shaping for use at a later date. Wrap tightly in gladwrap and place in an airtight container. – These would be great inside pita bread or wraps. This is the best spaghetti and meatballs recipe I have ever come across. It tastes devine and has a lovely citrusy flavour, you really can’t tell that you are eating a dish that has less than half the fat of the usual version. It is also lower in carbohydrates and has much less sodium than normal. This version is also extra nutritious as there are vegetables hidden in the meatballs, which should help you to reach the recommended 5 serves a day. 1. Heat oven to 180 degrees celsius and line 2 baking trays with baking paper. 2. In a large bowl combine beef and pork mince, cheese, worcestershire sauce, mustard, vegetables, egg, pepper and breadcrumbs. 3. Shape tablespoons of mixture into balls using damp hands. Place on prepared trays, leaving 2cm gaps, spray well with vegetable oil and bake for 12-15 minutes or until brown and cooked. 4. Place tomatoes, water, stock cube, garlic, lemon zest and parsley in a large saucepan. Bring to the boil over medium heat and simmer for 10-15 minutes. 5. Cook spaghetti according to packet directions and drain. Meanwhile, stir the meatballs into the sauce and simmer for 5 minutes. 6. Serve meatballs and tomato sauce over spaghetti.